The Cotswolds - Beautiful and Charming "Heart of England"
The Cotswolds is a beautiful region of rolling hills and charming villages sometimes called the "Heart of England". 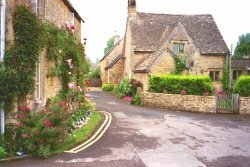 Ideal for short breaks in UK or England vacations, these old "wool towns" with their Cotswold stone houses are quaint and the peaceful countryside will refresh you. Our first Europe Family Getaway was to this lovely region, combined with a weekend in London. The beautiful Cotwold villages and towns are a perfect setting for Romantic Weekend Getaways or honeymoons. It's an area of great beauty, peace and charm. Since English is spoken, it is a great destination for a first trip to Europe for families or couples. There are many quaint villages and hamlets in the Cotswolds. My three favorite villages make great bases for your Cotswold Vacation. These excellent choices for accommodation include Cotswold Manor House, Cotswolds Country House Hotel and Luxury Cotswold Hotels. Charingworth Manor Chipping Campden - 3 miles east of Chipping Campden, 01386/593-555, beautiful views of Cotswold countryside. 14th century Cotswolds Country House Hotel, beautifully decorated rooms with antiques. T.S. Eliot ...guest in the 1930s. Restaurant with traditional and Mediterranean cruise. If you aren't sure which village you would like to stay in but would like the best Cotswolds hotel, these Cotswold hotel reviews might be helpful. - Lovely Cotswold B&B in charming village, gardens, great breakfast. Check out the Cotswolds B&B page. This is a great way to meet the locals and other travelers from around the world. Our children loved this experience. Blenheim Cottage - Cottage located in the village of Oddington about 2 miles east of Stow on the Wold. Staying in a Cotswold cottage allows you to cook some or all of your meals and to have extra space to relax and "live like a local" on your England vacation. Check out Cottages UK Directory, listing holiday cottages to rent in the UK with links to their websites....click on "Gloucestershire" under the County Index England section. Cotswolds Bus - There are two bus routes through the Cotswolds.....Moreton in Marsh to Chipping Campden and Moreton in Marsh to Stow on the Wold. The Tourist Information Centre has a pamphlet "Exploring the Cotwolds by Bus" if you are considering this option. Cotswold by Car - This is the best way to explore and discover all of the beautiful, charming villages of the "Heart of England". There is one Car Rental (Car Hire) - Robinson Gross Self Drive www.robgos.co.uk They have one day rentals to explore the Cotswolds. The Cotswolds is ideal for a Walking Holiday UK....or just include some short walks on your Weekend Break in England. The beautiful scenery, along with quaint villages and many walking paths are a winning combination. The charming towns are often quite close together, so it is easy to plan breaks for food or rest while walking in the Cotswolds. Here are some popular Cotswold Paths to check out. Upper Slaughter to Lower Slaughter is an easy 1/2 mile distance. We did this easy walk (picture to right). Stow on the Wold to Broadwell is about a 45 minute walk. Windrush Valley - Bourton on the Water to Windrush - about 5 miles. Guilting Power to Naughton is a pleasant short walk. Cleeve Hill across the Hill, which is the highest point in the Cotswolds and has great views, via Belas Knap or Postlip. 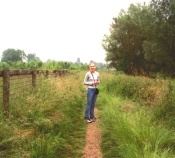 Cotswold Way - 90 mile footpath between Bath and Chipping Campden. It would take a week and a half to complete the walk or just do a short part of it. Have you been to The Cotswolds? Do you have a favorite village, hotel or attraction that everyone should know about?